Gary Penington is the Owner and President of Southwest Video Productions. 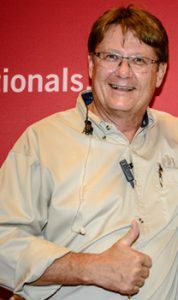 In 1980, Gary founded Southwest Video Productions to focus on video production for special events. In 1984, he expanded his services to include video depositions. In 1996, Gary became Managing Director of FLC’s new, state-of-the-art Community Concert Hall. Over the next 12 years, Gary booked and produced more than 1,200 live performances, with an accumulated attendance of over 399,000. > Chase Field in Phoenix, Arizona. Southwest Video Productions continues to grow, with a focus on video depositions, voice talent and concert productions. Contact us to learn how Gary and his team of professionals can assist with your project.